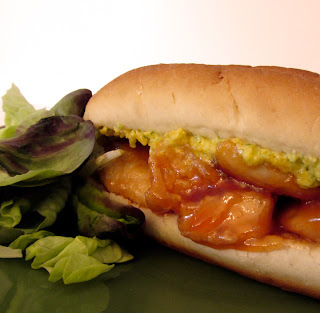 You might have seen my last sandwich post: Sweet & Sour Pork Sandwiches. This week it's a chicken version, but it's no copycat! I modified my sweet & sour sauce, switching out the brown sugar for white and adding a bit of garlic. Not a big difference, but perhaps better suited to chicken. The sweet & sour coats deep fried chicken cutlets which are topped with a cheddar bell pepper sauce (which is adapted from a recipe I found, from Gourmet, on Epicurious). All of this is served up on a soft French Roll. Yummmm! 1. For the pepper sauce: combine all of the ingredients in the small bowl of a food processor. Process until finely chopped, stopping to scrape the bowl as needed. Transfer the mixture to a small bowl, cover, and chill for at least an hour. 2. For the sweet and sour sauce: in a small saucepan, whisk together the sugar, cornstarch, and garlic powder (to avoid clumping). Whisk in the ketchup and water until smooth. Whisk in the vinegar. 4. Lay the chicken breasts and tenderloins in a single layer. Place a layer of plastic wrap over the pieces. Pound to an even thickness with a meat pounder (about 1/4" thick). Leave the tenderloins as is, but cut the breast pieces in half short-ways (to make two squarish pieces out of each). 5. Place the chicken into a large Ziplock bag along with the 1/3 cup of cornstarch. Seal and shake vigorously until each of the pieces is coated evenly. Set aside until ready to use. 7. Working with only a few of the chicken pieces at a time, shake off any excess cornstarch and place into the oil, being careful not to crowd the pan (chicken should not be touching). Fry until very light golden, flipping once (about 1-2 minutes). Transfer the cutlets to a paper towel-lined baking sheet. Repeat with the remaining pieces. 9. Open 4-6 rolls. Distribute the chicken evenly onto the bottom buns. Spread about 4 tbsp of the pepper sauce on each bun top (you may have extra sauce, which is great to use as a veggie or cracker spread). Assemble and serve!